Doughnuts? Donuts? I went so far as to take a poll. Opinions seem to be fairly evenly split but doughnuts did get a slight edge. Either way, they are seriously delicious. So, have you been seeing these "doughnut muffins" all over Pinterest? The taste of doughnuts without the deep frying. If, you, like me, are tragically afflicted with DFP (deep fry phobia) then you probably have a few of those recipes pinned. 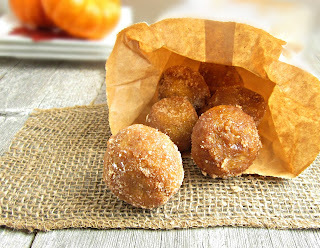 They were on my long, long list of treats to try when I happened upon a pumpkin version in an adorable doughnut hole size and the recipe quickly shot to the top of my list. So now that I've made them, let's discuss. First of all you should know that, if you make these, you will hate me because you'll blame me for the fact that you ate half of them standing up in the kitchen while dunking them in the cinnamon sugar. For heaven's sake, no matter what you do, DO NOT taste one of these while you're doing that because you will forgo putting them on a plate and just move them straight from the sugar into your mouth. 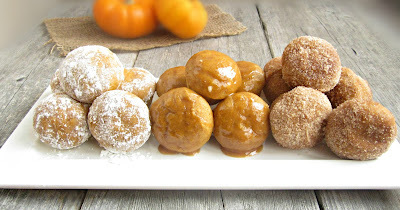 In fact, while I was licking buttery cinnamon sugar off my fingers I tried to think of a technique that would prevent you from eating half of these standing up in your kitchen. As far as I can tell, the only option is that you make them and then toss them directly into the garbage. But if you insist on trying one just remember that you've been warned. OK, my conscience is now clear but you're still going to make these, aren't you? Of course you are. I made them twice. The first time I followed the recipe and the second time I tweaked and experimented. So here is the recipe along with some advice to get you started. And will I make them yet again? Oh, yeah. Enjoy! In a bowl, whisk together the flour, baking powder, salt, cinnamon and pumpkin pie spice. In a separate bowl, whisk together the oil, brown sugar, egg, vanilla, pumpkin puree and milk until smooth. Add the dry ingredients and mix just until combined. Spray a 24 cup mini muffin tin with non-stick spray and scoop 1 oz. of batter into each cup. I used a 1 oz. scoop for even distribution. Bake in a pre-heated 350 degree oven for approximately 12 minutes or until a cake tester comes out clean. While the doughnuts are baking, prepare a bowl with the melted butter and another with the sugar and cinnamon combination. Remove the doughnuts from the oven and allow to cool just enough to handle. 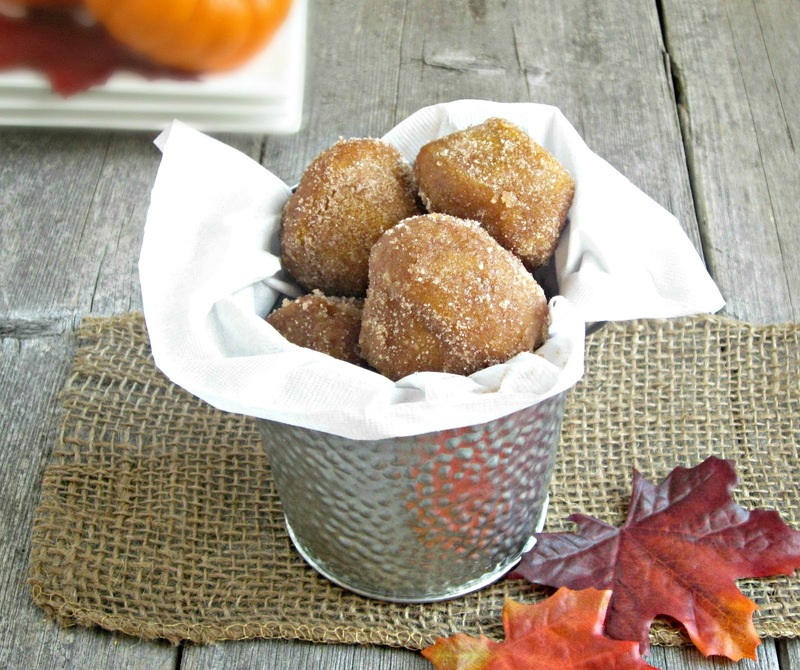 Dip each doughnut quickly into the melted butter and then roll in the cinnamon sugar to coat. I found, though, that even if I removed the doughnuts quickly they still soaked up a lot of butter. They were delicious but became quickly soggy. When I made the second batch I used a pastry brush and got better results. The second time I made them, I also divided them into three groups. 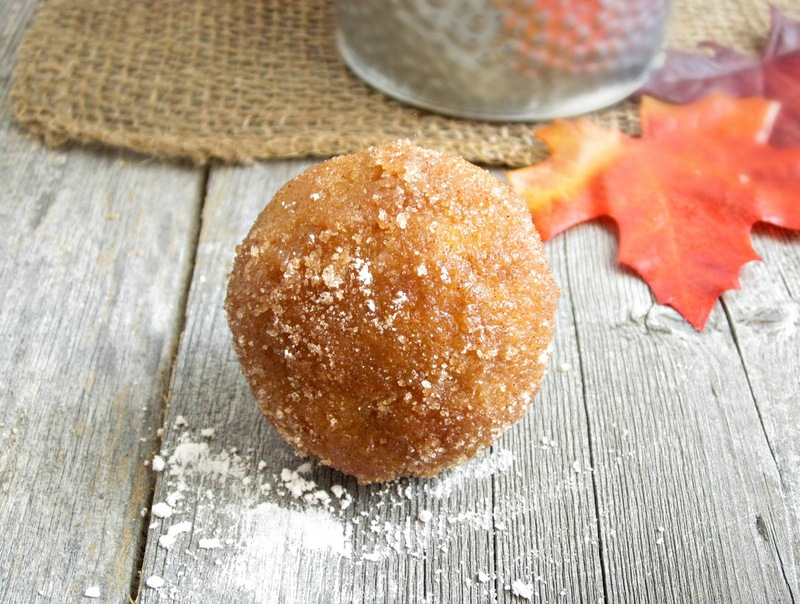 The first got the butter and cinnamon sugar coating, the second got only powdered sugar and the third got a glaze. Both the powdered sugar and the glaze gave less of that freshly fried doughnut taste but were lighter and less greasy. Brian and I both agreed, though, that the glazed version wasn't very interesting, the powdered sugar version was good and the butter and cinnamon sugar version was worth eating half of standing up in your kitchen. And I will be doing some of these this weekend. The glaze ones already have me drooling. Lovely! These look wonderful and I pinned them so that I would have the recipe when I have time to make them. One of my co-workers brings in Munchkins every Friday. I think this week, I am going to wow him by bringing these! They looks so delicious. I love that you baked these and rolling them in sugar and cinnamon just takes these up a notch. Absolutely love the recipe. Ohhhhkayyy these look amazing. And eating the holes makes it MUCH healthier than eating the whole donut... right? right? My name is Kayle, and I too suffer from DFP. Those little balls coated in sugar look so tempting! I fried up some chocolate doughnut holes last week. I love the idea of baking instead, healthier and quicker! I feel like these are a dangerous snack, can't have just one! I'll fry whatever you want as long as I get some. I've only made a non-pumpkin version...and it was pre blog. Looks like I'll have to try these...perfect for when Nick is home this weekend! Love this! Looks soooo good!! These are fabulous, Anita! I need some pumpkin donuts stat! These look amazing ... the cinnamon/sugar version has me drooling ... I'll have to make them on Friday and I've the feeling again on Sunday to share with work friends because I know that by Saturday morning the entire first batch will be gone ... I'll just have to make them late on Sunday to make sure still be doughnuts to take with me on Monday morning. Love donut holes! I have memories of getting them at our local bakery with my parents when I was little. Now I'm getting all emotional and inspired to make something way better, like this! SO trying these, they are the first baked donuts I have seen that actually look like donuts! Oh my gosh these look incredible! Pinning these now to make this weekend!! Delicious! I am actually making these for a wedding. They are so very good. Thank you for sharing another lovely recipe. A much needed jump start to a slow and dreary morning. I hope you have a beautiful day! I can't wait to try these and I won't blame you when I eat them in the kitchen, It's where I do all my "taste testing." I would definitely go for the cinnamon sugar ones, just something about cinnamon sugar in the morning with my coffee, best way to start off a day! Pinned. Could of fooled me! These don't look baked at all! Yum Yum Yum Yum! I want them now! Do you use a mini muffin tin for the shape it provides as they bake or just to keep them from rolling around? I haven't got a mini muffin tin but I want to try this recipe! Hi Megan - I used the mini muffin pan for both reasons. I was concerned that they might spread if they didn't have a container to bake in and it provided the shape. Be careful not to fill it more than 2/3 up if you want the roundish shape. Otherwise they will develop little muffin tops, although they will taste just as good. Good luck and let me know how you liked them! I'm going to make these for the neighbors for our Neighbohood Watch party. How many does the recipe make?? The recipe makes 24 minis.